It begins with krautrock. I mean, doesn’t everything, really? The extended instrumental sections in the middle of “Vermilion Sands” pay homage to the propulsive “Motorik” rhythm on classic Neu! tracks like “Hallogallo” and “Fur Immer,” which evoke a Springtime drive on the Autobahn. It was obvious from the start that there would have to be a travel sequence in the video, but what sort of vehicle would Busby ride around in? In the J. G. Ballard book that inspired the song’s lyrics, the denizens of Vermilion Sands lazily cruise around the desert in giant wind sailing craft, and at first I envisioned Busby piloting something like that. I could just see him at the helm, dressed like Thurston Howell, III — that fit right into my idea of him as the spoiled scion of a wealthy family from the planet Horndog. However, in the end I decided it had to be something closer to an automobile, both because it felt right and because it would be a helluva lot easier to draw. The yacht club get-up was a keeper, though. 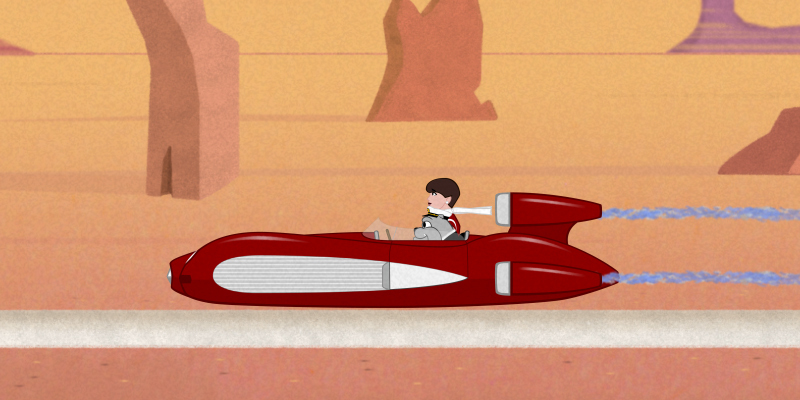 Now, Luke Skywalker’s Landspeeder is obviously the pimpinest ride of all time, especially for desert travel. But I also dearly love the styling of muscle cars from the fifties and sixties. While browsing through images of the evolution of the Corvette Stingray through the years, I stumbled across a picture of the vehicle that defined the aesthetic of the entire line: the Corvette SS. This was a concept car built in 1957, intended for competition at Le Mans and, boy howdy, ain’t it just the most sci-fi car you ever did see? Take off the wheels and bolt on a few Landspeeder-style turbines et voilà, you have the ideal chariot for our handsome hero. The original SS was powder-blue, but I thought Busby would prefer a warmer color for his ride. When I was creating the art in Illustrator, I noticed the program had a default color swatch labeled “Martian Red” — perfect! The starter button was modeled after the ones on classic video game consoles, and the final touch was a vanity license plate reading BZZZ-B. Animating the craft was simply a matter of sliding it across the screen, but the exhuast was a little trickier. In Photoshop, I created a file with 8 layers, each with a strip of blotchy brush strokes (a). When these layers were organized into a looping sequence in After Effects, they gave the impression of a roiling puff of smoke (b). I then added scaling and opacity animation to the sequence so it appeared that the puff was expanding and fading away (c). Finally, duplicates of this sequence were placed under the turbines of the hovercar as it moved across the screen and were overlapped to create the impression of exhaust trailing behind the vehicle (d).